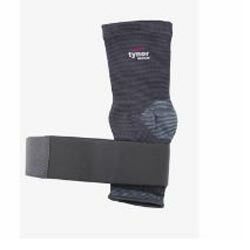 Ankle Binder also helps provide protection from further injury. Has a Breathable material and provides soothing heat retention. 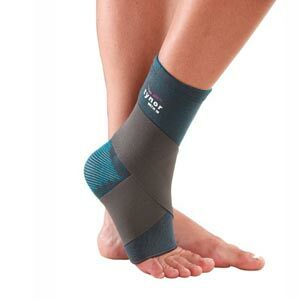 The elastic straps help support the ankle as the foot moves. 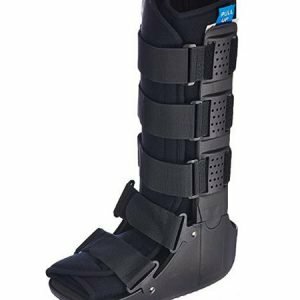 It protects sprained ankles and bilateral stays on both sides control eversion without restricting normal range of motion. 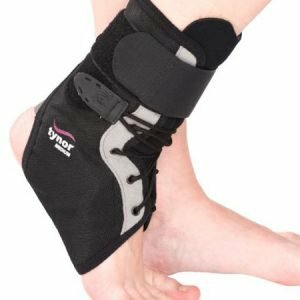 Ankle Binder is an effective device to support, compress and partially immobilize the ankle following injury or sprain to control pain, oedema or inflammation. 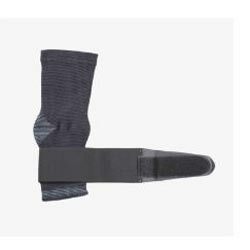 Composed of two components, compression sleeve and elasticized strap. The sleeve is knitted in 3 dimensions so that it conforms to the complex anatomy of the anklet with exactness. Elasticized wrap in figure of eight improves ankle stability, prevents inversion or aversion injuries, allows controlled compression and pain relief. Anatomically shaped with mellowed heel portion for better compression and grip, easy ankle movement. Perfect conformance to the complex anatomy of the ankle improves comfort. Bi-layered, cotton on the inside, a dermophillic interphase improves sweat absorption, comfort and compliance. Bi-layered, nylon on the outside ensures durability, improves aesthetics and color fastness. Four-way stretchable fabric ensures effective compression along with comfort. Two layered with interwoven airspace retains body heat effectively, speeds up healing and allays pain.